Get away with some of your favorite Monster High™ character dolls dressed for frightseeing and fierce island fun! The beast friends are ready for a wild vacation in outfits inspired by jungle elements. The fashions are fierce and the accessories to-die-for! Articulation at the shoulders, elbows and knees adds to the fun with more scary cool poses and storytelling possibilities. Fiery Jinafire Long™ doll, daughter of a Chinese Dragon, wears a tiki mask-inspired print on her dress. Uhhh-mazing accessories include flame-detailed shoes, a dramatic chest plate, jewelry and hair piece. 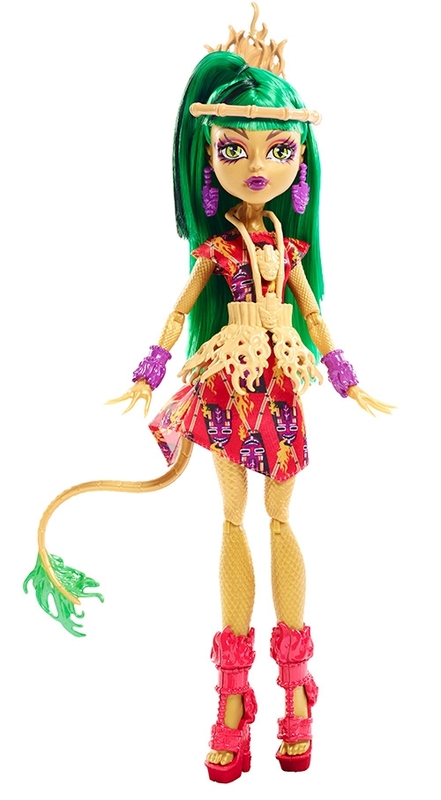 Monsterrific details, like green-streaked hair, showcase her freaky fabulous flaws. Ghouls at home will love learning to embrace what makes them unique along with their beast friends from Monster High™. Collect them all for the vacation of an un-lifetime (each sold separately, subject to availbility)! Includes Jinafire Long™ fashion doll wearing clothing and accessories. Doll cannot stand alone. Colors and decorations may vary. Features: Get away with favorite Monster High™ character dolls! Each is dressed for a wild vacation in an outfit inspired by jungle elements. Articulation at the shoulders, elbows and knees adds to the fun with more scary cool poses and storytelling possibilities. Fiery Jinafire Long™ doll, daughter of a Chinese Dragon, looks hot with a tiki mask-inspired print on her dress. Flame-detailed shoes, chest plate, jewelry and hairpiece heat up the look even more. 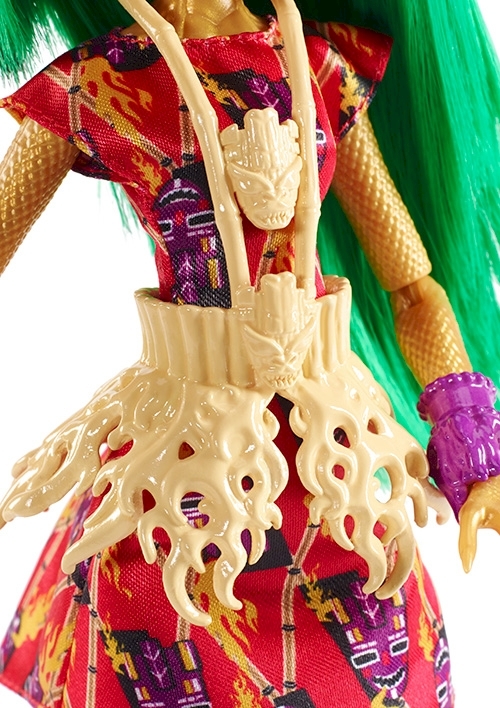 Monsterrific details, like green-streaked hair, showcase her freaky fabulous flaws. Collect all of the Monster High™ ghouls in vacation gear for the getaway of an un-lifetime.